Braving a driving rain (hah! 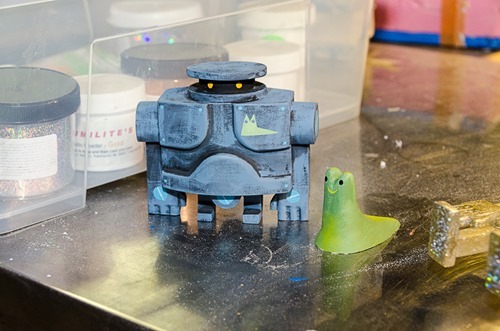 ), we made it out to Amanda Visell + Michelle Valigura’s studio nestled in the hills to check out the work on the soon-to-be-released smaller-format AVAW 3A-inspired resin bots. Micro Bramble + Slug (above), looks great in his smaller, squished form. While we didn’t get a very good look at Micro Bertie+ Snail as he was about to be cast, we’re pretty sure he’ll bring the charm. Oh, note the header card painting. Amanda hand-paints all of her product art. We also spied a table full of sparkly awesomeness: one-off glitter Brambles—Thailand bound— waiting for Amanda’s painted touches. So far a pair of cats, and a tiger grace the metal titans, what’s next? Behind every awesome artist are hard-working interns and assistants. Kevin Chan and Nellie Le, artists in their own right, toil tirelessly—sanding, casting, and shipping—to help make Amanda and Michelle’s visions a reality. Keep an eye out for Micro Bramble and Micro Bertie – they’ll be out before you know it. Hit the jump for a look at some of the process of the micro bot industry.